KANSAS CITY, Mo. 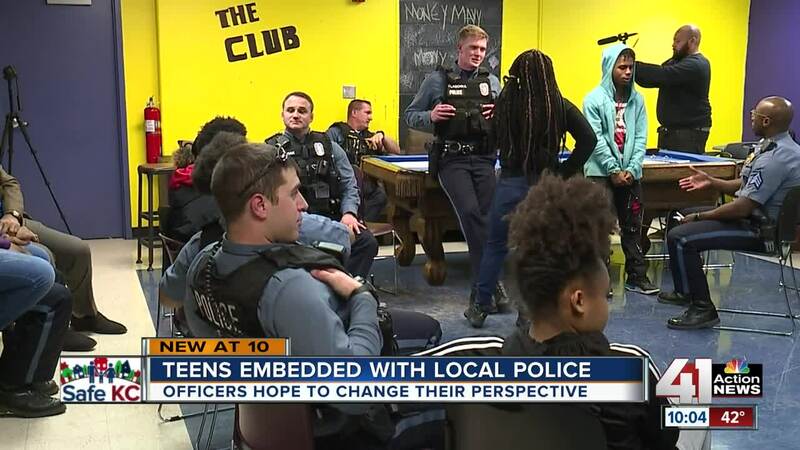 — The Kansas City Police Department has partnered with the Boys and Girls Club of Greater Kansas City and the Police Foundation of Kansas City on a unique program aimed at building trust between police officers and young children. "Police officers are really cool, you really just need to get to know them," one program participant, Elizabeth Guevara, told 41 Action News on Friday. Guevara is one of 15 teens learning about KCPD to break down stereotypes. "I thought it was going to be boring when I first heard of it, and once I started coming, the more days I came, the more I started getting attracted to it and it was fun," said Manny Moe, another participant in the program. The program is part of the Youth Police Initiative, where the talk is real. "Because the unfortunate part is that the only experience they've had with law enforcement is watching us arrest aunties or dads or moms or cousins," KCPD Capt. Jeffery Hughley, one of the program coordinators, said. "So the relationships with us have not been positive. A lot of them are very hesitant, very standoffish." But over the week-long program, teens and officers share with each other their experiences — and find out that they're not so different after all. "I mean, to see that sort of transformation take place in such a short amount of time," said KCPD Sgt. Mike Lenoir, another program coordinator. "There's no place that we can't get to." The initiative, also known as YPI, has had success in other cities, which was all the more reason that KCPD Police Chief Rick Smith wanted to bring it here. "It's all about building that relationship, having that structured environment, safe environment for the kids to talk to the cops and ask the questions they've always wanted to ask," Smith told 41 Action News. This week, the fourth group of this initiative met. For the time being, it's the last group of the program, unless it can secure additional funding. A grant covered the pilot program. KCPD leaders hope the community will donate to the Boys and Girls Club to keep the initiative alive. "When things aren't working, when we become the fifth most violent city, we have to try things," Smith said. To learn more about the Youth Police Initiative, visit its website.